This revolutionary fixture is integrated with an Axon HD media server that is loaded with a wealth of High Definition digital content. Coupled with a high output QuaDriveTM light engine, the DLHD delivers bright, crisp and beautiful images to fuel creativity. A Content Management Application running on your PC workstation or laptop computer gives you remote access to manage and upload content, upgrade software as well as configure multiple DLHD’s on a fixture network. 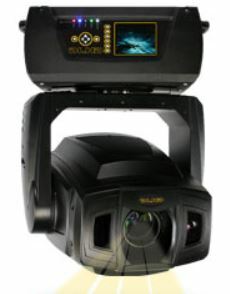 The DLHD represents the fifth generation of digital lighting products from High End Systems Inc. and is the flag ship addition to the product line, which includes the Axon HD and HD Pro Media Servers.